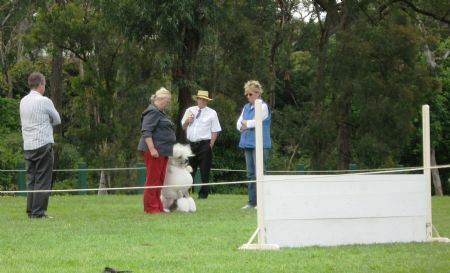 Obedience Training is an organised activity conducted through local clubs all over New South Wales. A full list of these clubs can be found by visiting the Dogs NSW website www.dogsnsw.org.au then going to the Activities & Events tab, click on the drop down box “Obedience,” then the drop down box “About Obedience.” You will find a link to all the local clubs at the bottom of the page. Community Companion Dog (Trial award C.C.D) – involving basic heel on lead, stand, recall and sit/stay down/stay exercises. Novice (Trial Award C.D) – free heeling, more complex recall and retrieve and longer stays. Open (Trial Award C.D.X) – more complex recall, retrieve, stay, jump and handler out of sight exercises. Utility (Trial Award U.D.) – This involves finding lost articles, scent discrimination, signal exercises and a range of other complex exercises. Utility Dog Excellent (Trial Award U.D.X.) – This involves more complex extensions of the U.D. exercises. You can find out more about these exercises at the Dogs NSW website link mentioned above. A new sport has recently developed called Rally-O. This is a fast moving activity where enthusiasm, competence and encouragement are emphasised rather than precision.You can read more about Rally-O at www.ankc.org.au/Rules.aspx scroll down to the Obedience heading and click on the link Rules for the conduct of Rally Obedience Trials.